The alarm shrieks at me through the French blue coverlet, locates me in the cave of sleep. 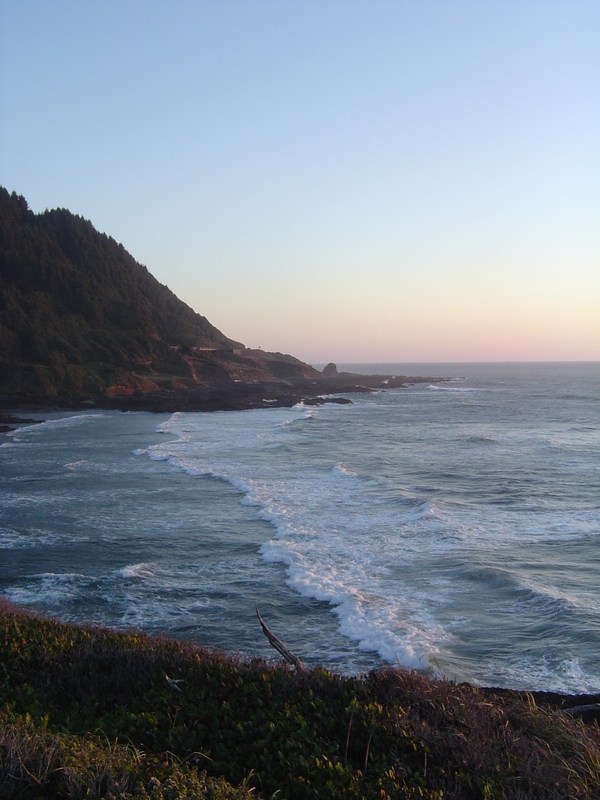 Dream wisps of a rocky ocean coastline and inviting white buildings fade as I force open my eyes. It’s Tuesday and I am being called to work at seven o’clock. It seems impossible that it is time to wrest this body from the comfort of bed; the last time I had glanced at the clock it was four thirty. Neighborly birds had engaged in a long conversation about which branch belonged to whom, then they gave such a loud a capella concert that I closed the window and put in ear plugs. Shortly after that, the banging of my heart rudely startled me. It felt like a chastisement even though I had done nothing but try to get back to sleep. There had been more awakenings than stretches of sleep. I step lightly on my feet and head for the shower. The pounding continues, interrupted by a few of the jazz-rhythms I know so well. Skip/leap/spasm; jump with long pause, then sudden flight. The ones that stop me as I comb out my hair are the renegades, hammering as though I am made of steel, then respects no time signature and makes me dizzy. I rest, wait a bit. Should I stay home or go to work? I think of ten, usually eleven hours ahead of me, doing the work I have passion for but work that also can exhaust during the best of times. And when I get too little sleep for a couple of nights, my heart inevitably complains. Still, I have felt this way countless times and gone forward with obligations, or social and family plans. And this is the beginning of my “acting as if”: I look into the mirror and breathe carefully, then compose myself. I put on make up, eat breakfast, spend a few mintues reading a meditation book. I repeat a couple of times as I drink tea: I will be alright. I need to be alright. As though my wish is granted this time, the crazy beats stop as suddenly as they began. No need to call Dr. P or 911. I proceed with the morning’s routine. In an hour I am out the door. At work I trade information and smiles with co-workers, then focus on taking care of clients, work on lengthy documentation, facilitate group therapy, complete assessments of treatment needs, attend to individuals in private sessions. My heart makes itself known a few times like a loved albeit cranky relative but it is manageable; I am doing well enough. No one else knows what secret events are occurring inside my chest. I barely understand it myself. I am tired but walk quickly and with purpose, as is my habit and, today, also my conscious intent. At my desk, I close my eyes a few moments. I encourage myself: the day has ben productive and is passing and when night comes I will rest. I consult with a team member and then greet the next client. By mid-evening, I get into my car and turn on classical music, relieved. The cranky heart is quiet and the well-behaved one is busy keeping me going. I learned the value of “acting as if” long ago. Most children do. We are told to keep our heads up, that when you fall get right back up. We are trained to put the best face/best foot forward. And this has obvious benefits: we discover we are stronger and more sturdy than we supposed, and that to experience victory we have to learn from defeat. It is a skill used to face life on life’s terms, one that can lead to grace under fire and resilience under pressure. Act as though there is courage when fear is present, as if there reigns well-being and health instead of chronic pain. Acting as if can get us through rough days and nights but it also can provide us with essential dignity when we need it most. It feels better to gather my wits about me when consternation or discomfort set in, to look up and forward, not down. Most miseries can be addressed later. And so, I act as if this life could go on forever. That is where I come to on those days when I wonder if I can withstand the difficulties of heart disease: I sometimes refuse to think of what could be ahead, even while I cooly acknowledge the possibilites in the back of my mind. There are many ways to deny the full extent of the matter. I was thinking of all this as I looked at my books this morning. In the bedroom alone there is a five- shelf bookcase, and two with three shelves. Books are set atop the tightly wedged ones. 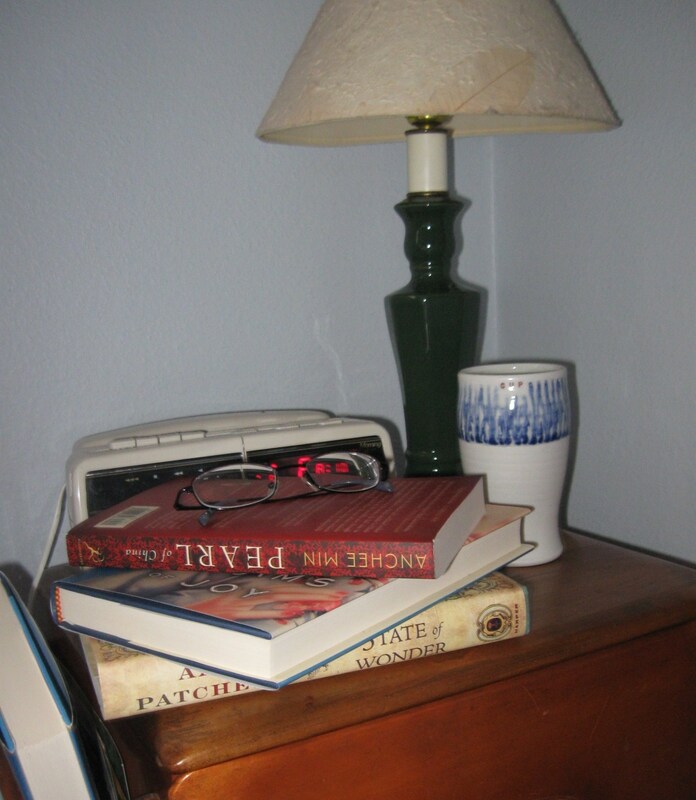 Several stacks of hardbound books tower at either end of the dresser and beside the bed. The bedside table has a shelf that is stuffed with cheap paperbacks, just in case I want a quicker read than the more literary tomes. But no book is really a quick read for me. I take my time at the very end of work and “free” days. I savor each line of an author’s words and then re-read many to enjoy a richer appreciation. I dissect those that stun me so I may learn more about the craft of writing. But occasionally I wonder why I keep buying books when there are already so many. The answer is simple. I love them. I want to be surrounded by them. I want to read them all. And by purchasing new or trading in old for newer ones I tell myself: You can read this next month, next year. They will be here waiting for you always, gifts of unknown worlds, characters that walk through these very pages. The books already read show me who and where I have been thus far. And the new ones point me toward the future, help me believe this life will be much longer-lived. There will be time enough. I could name a dozen more ways in which I forget I have heart disease. But I don’t generally awaken thinking about mortality. I think instead about all I want to do, give, and still become. In my estimation, denial has been given a bad name over the years. A common thought is that to deny is to not take responsibility, to not deal with reality. It perhaps allows me to avoid the truth a bit, but this gives me time to prepare for what is ahead. It grants me this present moment to live right within the center of life, however I care to do so–and encourages me to be beckoned by the continued journey. I look at this earthly life and still see the beauty of it. Tomorrow or the next day may not be mine, but for now, I choose to act as if they will.